Let's Be Friends is the thirty-seventh album by Elvis Presley, released on RCA Camden Records CAS 2408, in April 1970. It is the second Presley budget album to appear on the RCA subsidiary label. It peaked at #105 on the Billboard 200 album chart. It was certified Gold on 7/15/1999 and Platinum on 1/6/2004 by the RIAA. 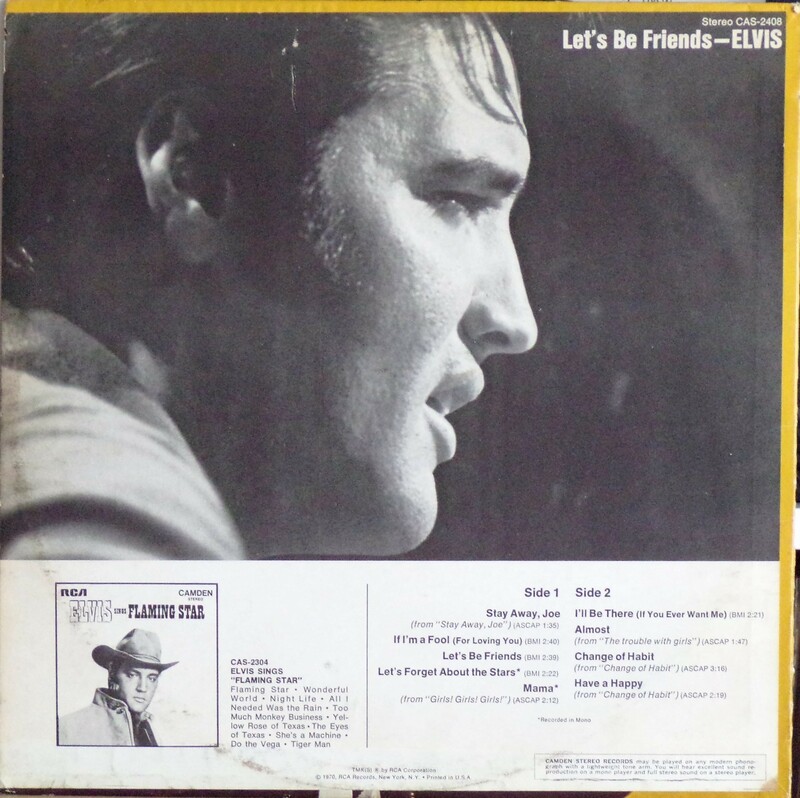 Similar to its predecessor Elvis Sings Flaming Star, Let's Be Friends collects mostly unreleased songs recorded for Presley film soundtracks. Given the recent work of the revitalized Presley, in the past the Colonel might have objected to this kind of market saturation, but under the terms of Presley's agreement with RCA, budget albums brought extra cash outside of contract stipulations. 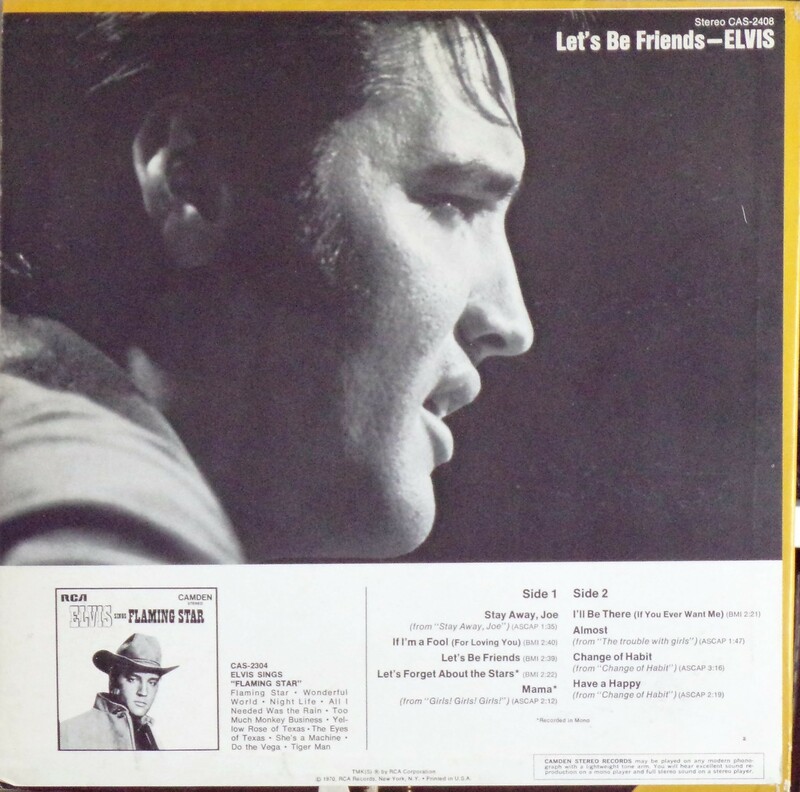 Two non-movie outtakes appeared from the winter of 1969 sessions at American Sound Studio in Memphis, "I'll Be There" and "If I'm a Fool (For Loving You)." The songs "Mama," "Let's Forget About The Stars," and "Let's Be Friends" were all recorded for but not used in their respective movies. "Mama" was sung in the film Girls! Girls! Girls! 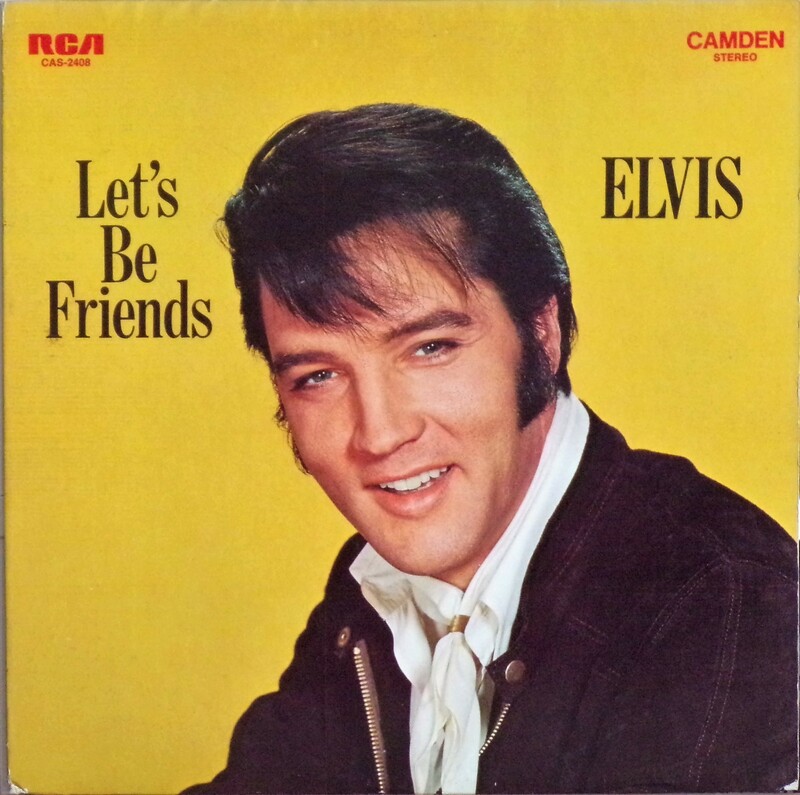 by The Amigos., and Elvis' version first appeared on this album, with an alternate, abridged version included on the compact disc Elvis Double Features: Kid Galahad/Girls! Girls! Girls!. Three tracks originated from Presley's then-current film Change of Habit (including the movie's theme song), making this in essence an enhanced soundtrack release for that film. 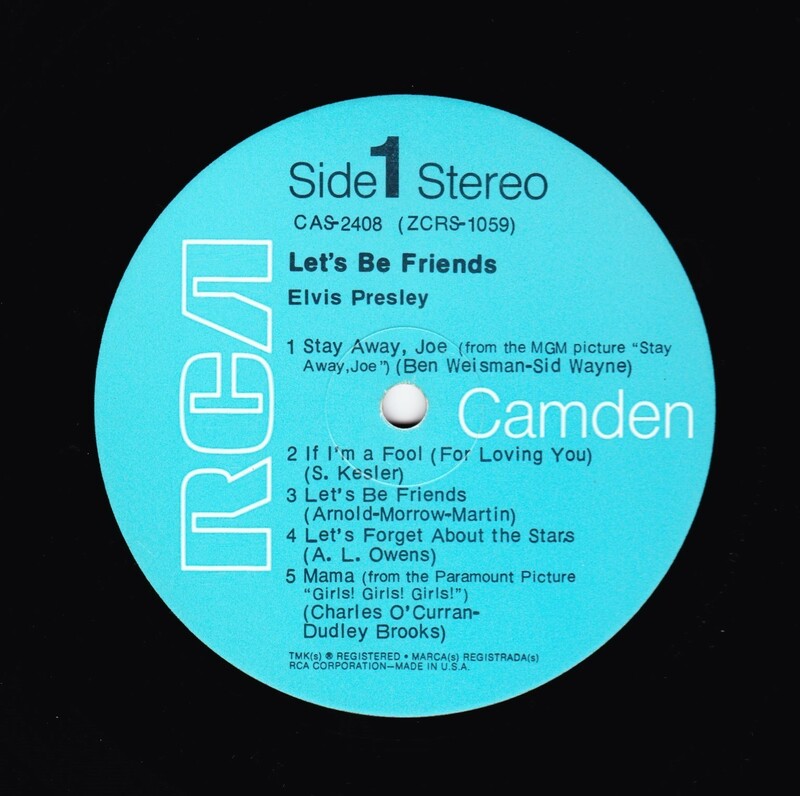 Like all Presley releases on the budget Camden label, this album has a very short running time, too short for a full-priced album in the 1970s. Front Cover : Photo of Elvis. Title to the left. Catalogue number top left. Camden top right. ​​Rear Cover : Advert for Flaming Star LP Camden release. Catalogue number top right. Printed in U.S.A. bottom centre. Text box bottom right. No number bottom left or right. Label : Blue. Non flexible vinyl. *NOTE* Side 2 Song 1 on both the rear cover and vinyl label is incorrect. It is listed as I'll Be There (If You Ever Want Me) by Gabbard - Price. ​It is in fact I'll Be There by Bobby Darin. This was later corrected on the Pickwick re-issue release, however only on the vinyl label, not the rear cover of the album sleeve. 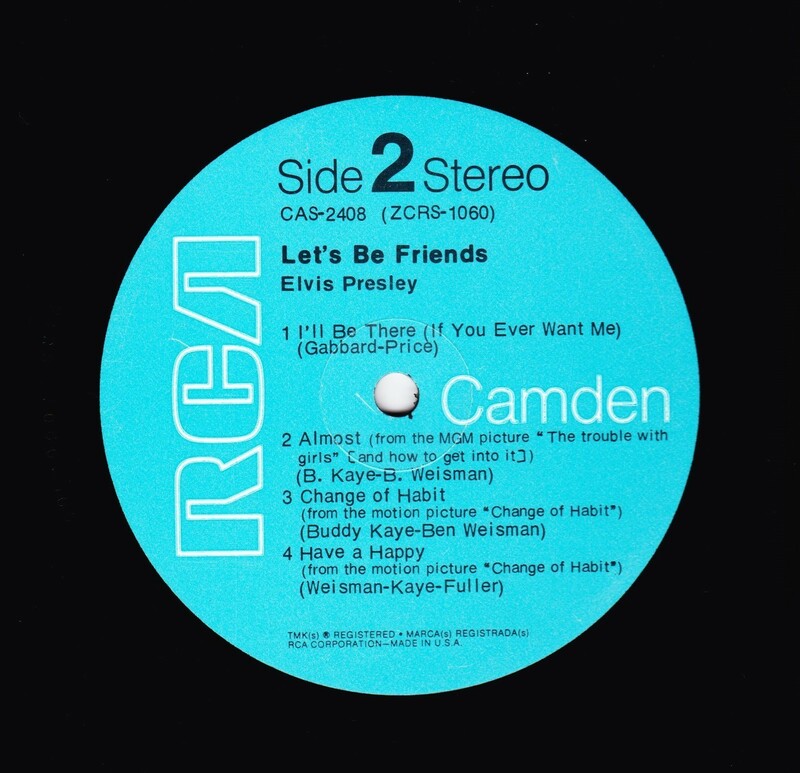 ​​Rear Cover : Advert for Flaming Star LP Camden release. Catalogue number top right. Printed in U.S.A. bottom centre. Text box bottom right. Number "2" bottom right.